My first contact with the act as if approach was during the late 1960s. This was just before I opened a therapeutic community for drug addicts. As part of my education, I visited an existing treatment centre based in Portsmouth. During the days there I became one of the community members, often being on the receiving end of the therapeutic programme. Part of the programme was the act as if approach. This involved giving the recovering addicts the following messages. You got into trouble because you developed irresponsible ways of satisfying your needs. This often involved hurting other people. You say that you want to take responsibility and be more caring towards other people. This will initially be difficult because you have not learned how to do this in your life – nor has it been rewarded. You can develop these new habits by acting as if you are responsible and caring. This may seem unnatural at first. But continuing to behave in this way will develop a new script and patterns. You can put these into practice every day and develop healthier ways of satisfying your needs and living a fulfilling life. This became a guiding principle for many people who wanted to make changes in their lives. It also became the basis for many therapy programmes. 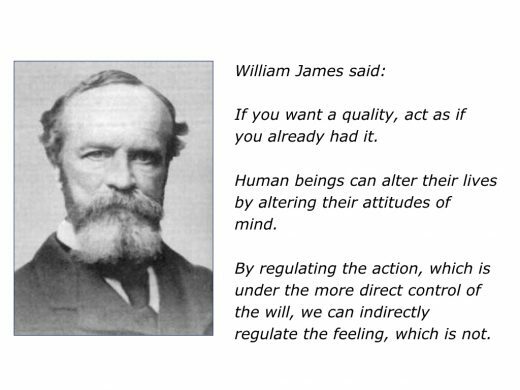 William believed that doing things differently – rather than just talking – leads to changes in feelings. 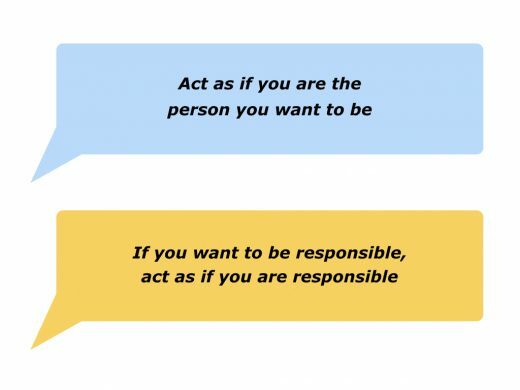 People could act as if they were the person they wanted to become. This could help to create a new habit and new rewards. He wrote the following. Action may not bring happiness, but there is no happiness with action. Act as if what you do makes a difference. It does. You can discover more about William’s life and work at the following sites. Some people may have reservations about this approach. They may express some of the following feelings. What about authenticity? Shouldn’t you be honest and true to your feelings? Acting as if sounds like you are doing something that isn’t honest. Certainly there can be drawbacks to the act as if approach. Initially there may be a yawning chasm between who you feel you are and who you are aiming to become. But we act as if every day of our professional lives. We go into role when carrying out our work as nurses, doctors, gardeners, trusted advisors or whatever. We aim to make the customer feel the centre of the world, for example, and help them to succeed. Pursuing that role properly – and following certain principles – can produce success for everybody. Another approach to acting as if is to base it on our own successful experiences. Everybody has a positive history of overcoming difficult challenges and delivering success. How can they use this positive history to tackle both present and future challenges? Here is one approach that seems to work. You can use it with individuals, teams and organisations. For the moment, however, let’s explore how it can work for a person. You can help them to go through the following steps. Imagine that the person says they want to stay calm, rather than get angry, in certain situations. There may be certain triggers that mean the person chooses to get angry. It can be that other people fight dirty, such as resorting to blame, so it can be helpful to identify these triggers. Imagine the person has identified the triggers. They can then choose their response. They can continue to get angry, leave the situation, stay calm or whatever. Let’s assume that the person wants to stay calm and, if possible, encourage the other people to find possible solutions to the challenge. You can invite the person to recall a time when, for example, they were behaved calmly in a heated situation. What did they do right then? What were the principles they followed to stay calm and help people to find solutions to a challenge? The person may say something like the following. I breathed deeply. I stayed calm, counted to ten and tried to see things in perspective. Speaking quietly, I got people to calm down. Slowing down the pace of the conversation, I invited people to focus on the real results we all wanted to achieve. I said something like: ‘As far as I understand it, the things we all want are: …’ I got people to focus on the things we had in common and that we all wanted. I then encouraged people to look at the possible options we had for achieving these things. If people started arguing again, I calmly brought them back to focus on the desired goal. Eventually we got to the point of pooling our ideas and producing a plan of action. This was then carried out and we reached the goal. You can encourage the person to describe in great detail what they did to, for example, stay calm. As mentioned earlier, they may have breathed deeply, counted to ten, looked at the big picture, speak slowly or whatever. You can then invite the person to mentally rehearse staying calm in the future challenging situation. 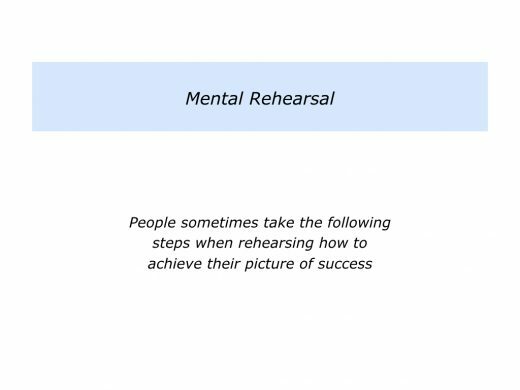 As you know, people often take the following steps when doing mental rehearsal. Peak performers relax and then click into gear when entering their chosen arena. They are fully present, follow certain principles and do whatever they can to deliver the goods. The person can follow this path in their own way to act as if they are calm. 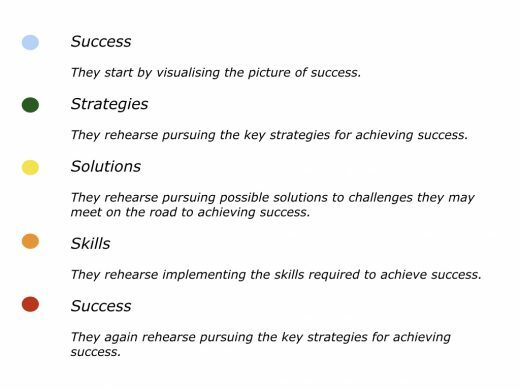 They can follow their successful principles and work to achieve their picture of success. They may find that, after a while, they are more able to be real in this role. They may develop the habit of staying calm and this behaviour becomes part of their true self. Imagine that you want to try this approach in your own life. You may want to behave like the person you want to be with your children, partner, colleagues or in some other situation. You may aim to be kind, encouraging, responsible or whatever. There are many ways to develop the desired behaviour. 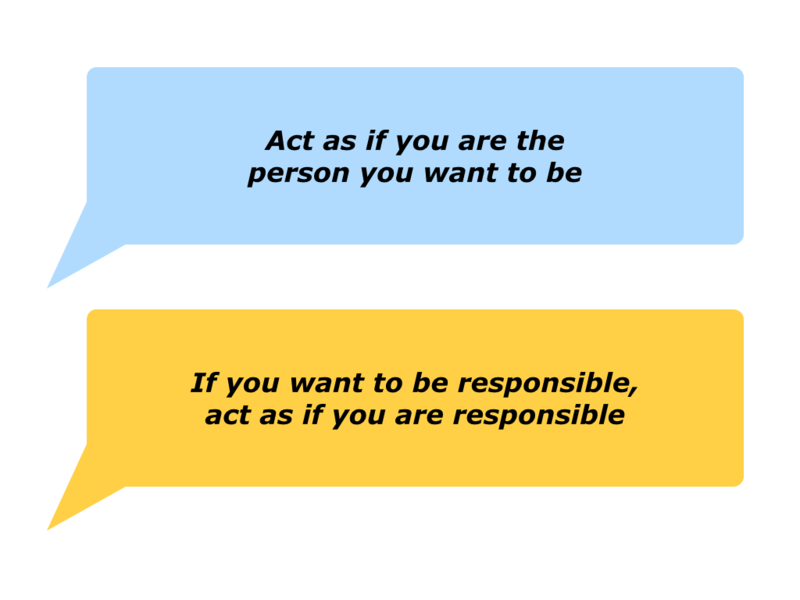 One approach is to act as if you are the person you want to be. Describe a specific situation where you want to behave like the person you want to be. 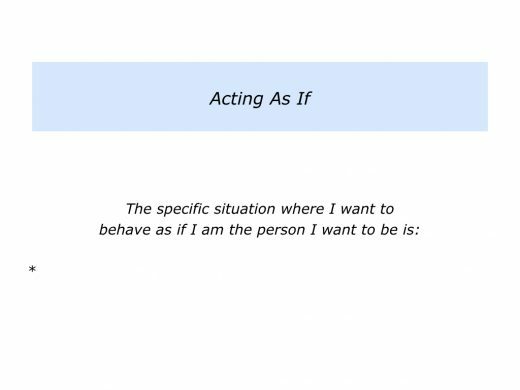 Describe the specific things you can do to behave like the person you want to be in this situation. 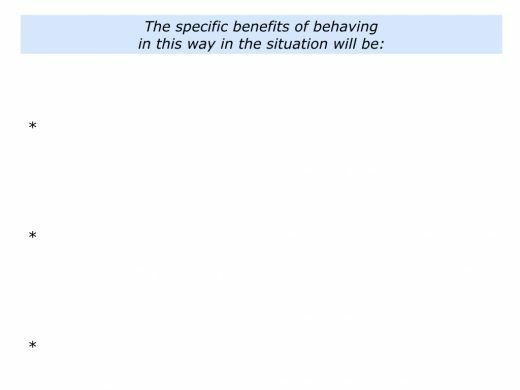 Describe the specific benefits of behaving in this way in the situation.